Garrett Leight Wilson M - Antique Gold / Pinewood w/ Blue Need Help? The Wilson M is a minimalist, yet highly refined and sophisticated sunglass. It features laser etched filigree detailing along the eye wire and end pieces, and silicone nose pads for comfort and a finely tailored fit. It is is offered here in a unqiue and rich color combo of antique gold, "Pinewood" temples, paired with pure blue lenses. 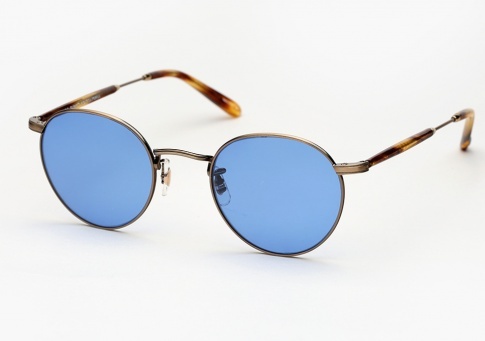 It is is offered here in a unique and rich color combo of antique gold, "Pinewood" temples, paired with pure blue lenses.